I thought I'd share this photo to show that I'm not just lazing around over here. 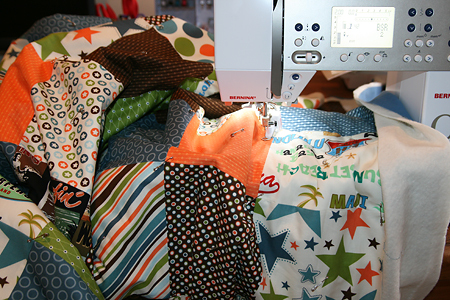 ;-) One thing I've learned on this latest project - a twin quilt is bigger than it sounds! I am in the process of quilting it using my fancy new Bernina Stitch Regulator. Which I love by the way. I'm about 1/5th the way done and am hoping between nap time and the weekend, I'll be binding by Sunday night. I also had to share this next photo for everyone to see my "cage". LOL Yep, this is what happens when you want to sew but have an adorable, 8 month old trouble maker crawling everywhere. 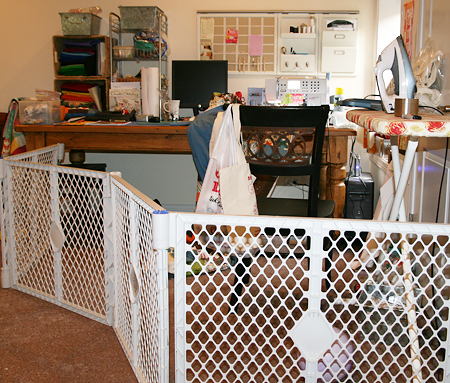 We have a finished basement which is our playroom and I've put my sewing area down there so I can work while the kids play. Kyler loves getting under my sewing table and going straight for the cords! It's funny because he will crawl up to the gate and cry, it's almost like he thinks HE'S the one in the cage, not me! I've promised myself that after this quilt is done, I will clean up my space and take a proper picture to share. I swear I'm not normally this messy!